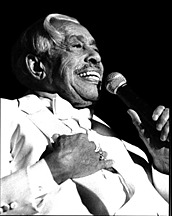 Cab Calloway was an important jazz bandleader and singer. He is probably best known for singing "Minnie The Moocher" (you know, "hi-de hi-de hi-de ho!") but he also won acclaim as Sportin' Life in Porgy and Bess in 1952 as well as in the film The Blues Brothers. He was also the first jazz singer to sell a million records.